Your opinion matters. Leave A Review Or Edit This Listing for Christian Assistance Program (CAP) - Severn United Methodist Church. 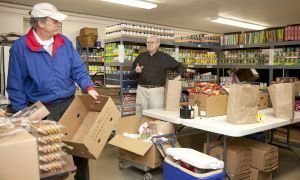 The CAP Food Pantry serves the community. The CAP Food Pantry is closed when AA County schools are closed due to inclement weather. Severn UMC collects non-perishable food at the Sunday Worship Service for blessing and distribution on the first Sunday of the month, or "CAP Sunday." The Christian Assistance Program is a private non-profit food bank sponsored Severn-Odenton area churches, providing food and clothing to the less fortunate residents of Odenton, Severn & Gambrills communities. All donations are greatly appreciated and are tax deductible. We always need more information on our pantries. If you know of any details, volunteer information, website, hours or more description information about Christian Assistance Program (CAP) - Severn United Methodist Church please add a comment (below the map on this page), with information. We will then display this for all visitors on this page.